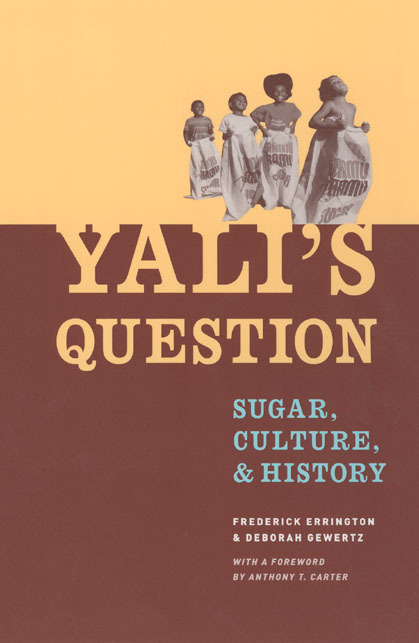 Yali’s Question is the story of a remarkable physical and social creation—Ramu Sugar Limited (RSL), a sugar plantation created in a remote part of Papua New Guinea. As an embodiment of imported industrial production, RSL’s smoke-belching, steam-shrieking factory and vast fields of carefully tended sugar cane contrast sharply with the surrounding grassland. RSL not only dominates the landscape, but also shapes those culturally diverse thousands who left their homes to work there. To understand the creation of such a startling place, Frederick Errington and Deborah Gewertz explore the perspectives of the diverse participants that had a hand in its creation. In examining these views, they also consider those of Yali, a local Papua New Guinean political leader. Significantly, Yali features not only in the story of RSL, but also in Jared Diamond’s Pulitzer Prize winning world history Guns, Germs, and Steel—a history probed through its contrast with RSL’s. The authors’ disagreement with Diamond stems, not from the generality of his focus and the specificity of theirs, but from a difference in view about how history is made—and from an insistence that those with power be held accountable for affecting history. 1. What Do They (Should They) Want? "[The book] is richly written and full of thick descriptions of people, places, and processes. It is also rich in terms of its theoretical contribution. Errington and Gewertz interweave a cogent and convincing argument about how to write and read history with their ethnography of [Ramu Sugar Limited], its workers, agents, adn owners, and ground it all within the history aof development in [Papua New Guinea]." "Yali’s afterlife finds him in good literary circles. Booker PLC washed some of his plantation profits to establish the Booker Prize. . . . Diamond’s book won the 1998 Pulitzer Prize for general non-fiction. Now, Errington and Gewertz, who appreciate and answer Yali with anthropological seriousness, are also in this sweet company." "Significant and fascinating books have been published from the Lewis Henry Morgan Lecture Series, including several that demonstrate how Melanesia has been a driving force for theorization in anthropology. Here is another."